First, we are hosting the annual meetings of the Western Association of the Religious Society of Friends (WARSF). WARSF is the larger association of Friends that we are part of. All are welcome to attend the Board of Oversight meeting, tomorrow evening, Friday 2/17, at 6:30 PM (for dinner, meeting to follow at 7:15), and the general Meeting of Members, following Quaker Heritage Day on Saturday 2/18 at 3:45 PM. Then on Saturday, 2/18, we have Quaker Heritage Day 2017! 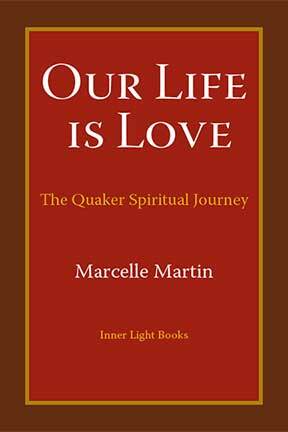 Speaker is Marcelle Martin, on her book Our Life is Love, about the ten stages of the Quaker spiritual journey. Please join us! See this page for full details. Finally, on Sunday, 2/19, join us beginning at 9 AM, for Singing Ensemble rehearsal. Then we have Sunday School classes for children and adults, meeting at 10 AM (and Marcelle will join the adults for further conversation from QHD and her book). Worship follows at 11 AM, with corporate song, prayer, and waiting worship, as well as a message from Marcelle, “A Community of Faithfulness,” based on I Samuel 17:34-50. We hope you will join us for this full weekend gathered in the Spirit of the Lord!